I'm still painting my kitchen cabinets. I am happy to say I am almost done. Then after that, I will be painting the walls. I can't wait. My kitchen is already looking more cheery and happy. I have decided to paint the walls, a mellow yellow. I am usually not a big fan for the color of yellow, but I do like it when combined with certain colors. Like retro-yellow and red or green and I like yellow and blue. My husband is halfway done with the ceiling. I know I know, crazy huh? It should have been done already and he is stalling. Good thing, I will be doing the walls. The ceilings were too high. As I paint my way down the hall, the ceilings are normal so I can do that. Believe me, I will be happy when he is done with his part. I am a bit disappointed in his lack of caring with the painting. Oh well. It's only paint and a little more time. After I paint the kitchen and dining area, I will paint the living room and entry. I'll probably take a little breathier, but not too long or else I will get out of the swing of painting. I will then work my way down the hall and I will do the hall bathroom - cabinets and all. Bedrooms can be done after the holidays, if I can stand it. So I have a huge painting project ahead of me. When I take that breathier, after the living room and before the hall and bathroom - I will work on, redoing the lighting. My husband wants to go out and just buy our fixtures and I want to redo them. He even mentioned about buying a new stove and microwave before thanksgiving. That would be nice. It's me. I manage the money and I think I can manage for another year with that old stove and counter-top microwave. old stove - new stove would be nice. 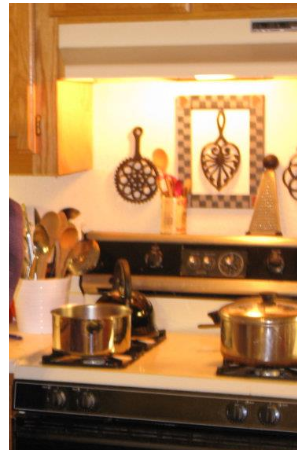 Hi Debby, you have a wonderful kitchen and it will be even more gorgeous when you complete your projects. 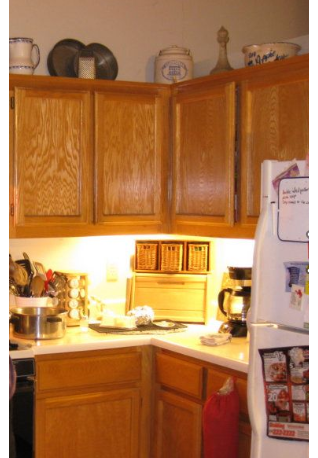 I painted my cabinets after new counters were installed and what a difference it made. Enjoy the process and have fun. Aw thank you. I'm still plugging away at it. I can't wait to get it done, so I can do the photos like all the big decorating blogs do.